When my friend Anne announced she was getting married in my neck of the woods and asked if I might be interested in making some apple pies in place of a wedding cake, I immediately called my aunt Marcy to consult. I hadn’t made a pie in a long time — years! — and I not only needed a refresher on the basics — how many apples? what spices? tapioca or flour? how much sugar? 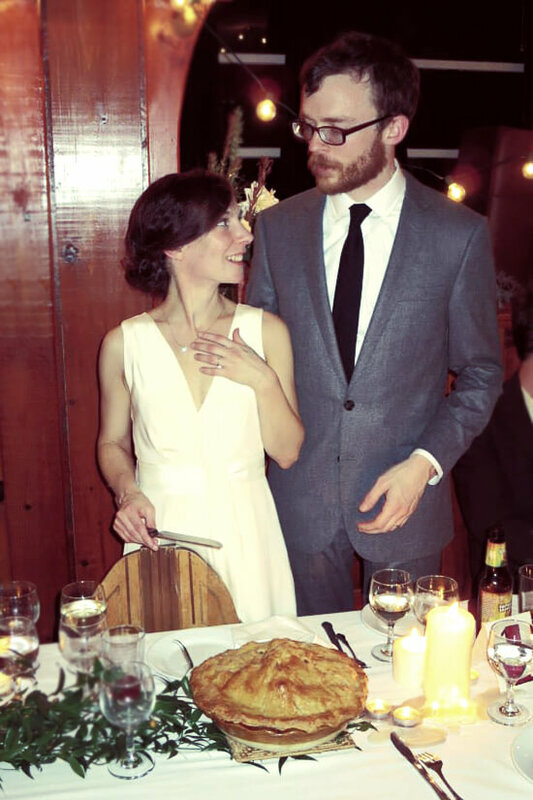 — I also needed help with the logistics: would I realistically be able to make, bake and store enough pies to feed an entire (albeit small) wedding? Could I face this challenge with grace and dignity? The conclusion we came to pretty quickly was no. Absolutely not. In my wise old age I have learned that sometimes it just makes sense to accept my limitations. Deep thoughts by Ali. After explaining to Anne that for the wellbeing of everyone in my house I would have to decline, we came up with a saner solution: I would make two ceremonial pies for the pie-cutting ritual. Two pies I could handle. Nobody in my house would be harmed. In the past few weeks, I’ve done a few test runs, seeking guidance from my aunt, the pie master in our family, the entire way. 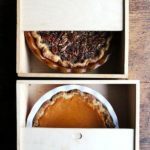 When it comes to making pies, Marcy cuts no corners, uses refrigerated bowls, a chilled marble rolling pin, and cold cold flour and butter. She follows the fraisage technique, using the heel — not the palm! — of her hand to cut the butter into the flour. She seasons the apples with both cinnamon and cloves, lemon juice and zest, and prefers tapioca to flour as a thickener. She never uses fewer than 10 apples per pie. Over the years Marcy’s pies have developed such a reputation that other members of my family are afraid to weigh in on the subject of pie. During these past few weeks, I’ve called both my mother and sister to seek their advice on various pie-making matters, but from both of them each time I faced the same response: Ask Marcy. I have done my best to relay my aunt’s pie-making wisdom here, with the exception, however, of the fraisage method, a technique I have not yet attempted, one that, once conquered, elevates the pie maker to the pie master: Marcy’s pie crusts boast an unparalleled level of flakiness. And so, I’m afraid, I leave you today with a quandary: To fraisage or not to fraisage? Perhaps something to ponder while apple picking this weekend? Happy Friday, Everyone. 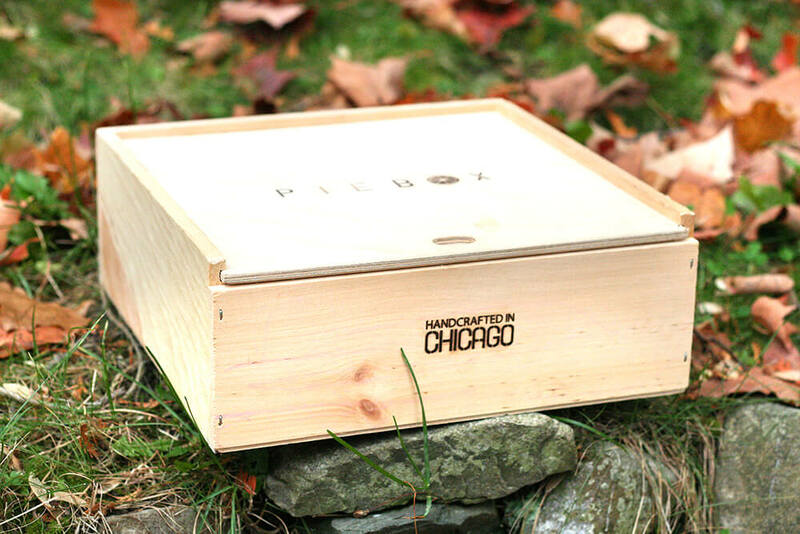 A dear friend living in Chicago gave me this piebox this past summer. Isn’t it fun? Wouldn’t this be more fun? 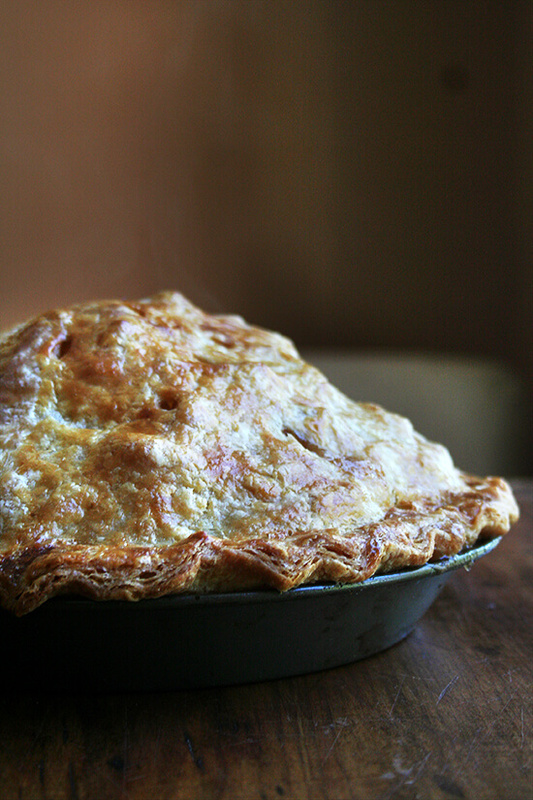 PS: The next Baking Steel post is up: an Apple Galette made with the trimmings of this pie as well as a few leftover apples that couldn’t quite fit into the mound. •If you don’t store your flour in the freezer, consider placing it in the freezer the day before you plan on making the dough (though I never do this). • If you want to make several batches of dough, rather than multiply the recipe and shove all of the ingredients in the processor at once, make separate batches consecutively. For example, I recently tripled the pie dough recipe below. To start, I cut up the butter and placed each portion on a separate plate in the freezer. Then I filled a four-cup liquid measuring cup with ice and water. Then I lined up three big mixing bowls and filled each with 320g flour, 2 T. sugar, and 1/2 tsp salt. Then I made one batch at a time using the food processor, wrapping each batch in plastic wrap before proceeding with the next batch. I know I am stating the obvious for many of you, but sometimes these tips are helpful for others. • On my local PBS station, I recently watched a Martha Stewart pastry episode during which she reminded viewers to: “Make it cold; bake it hot.” A good rule of thumb is to bake your pie on the lowest rack of the oven at a high temperature to start (around 425ºF for 20 minutes or so), and then to reduce the heat to a lower temperature (350ºF or so) for the remaining baking time, anywhere from 30 to 60 minutes longer. Every oven is different, of course, so this rule might not apply to you. I have been baking my pies directly on my Baking Steel, which helps produce a beautifully crisp bottom crust. • When you are rolling out your dough, again, try to keep tools and ingredients cold — my aunt uses a marble rolling pin that she keeps in the freezer. Preheat the oven to 425ºF with racks in the lowest part of the oven. Line the bottom of your oven with foil to catch spills. If you have a pizza stone or Steel, place it in the oven. 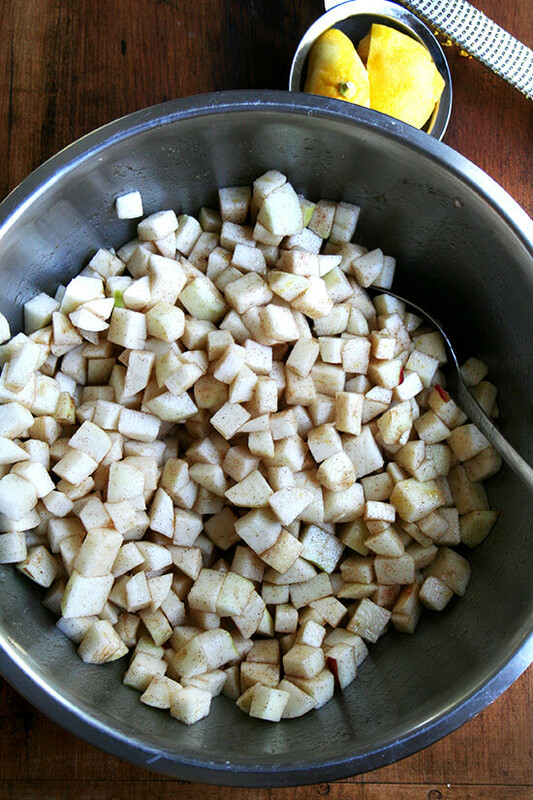 Peel the apples and cut into large chunks. Place in a large bowl and toss with the 3/4 cup of sugar, the cinnamon, the cloves (if using), the zest (if using), the juice of one lemon and the tapioca. Set aside. On a lightly floured work surface, place one pie dough round in the center. Roll it out into a circle two inches larger in diameter than your pie plate. Fold the circle in half and in half again. Place in your pie plate and unfold. Press down gently so that the dough fits into the corners. Place pie plate in the fridge while you roll out the second round. Roll the second round out in the same fashion, making it a touch larger in diameter than the first round if possible. To crimp the edges together, lay two fingers a finger’s-width apart from your right hand below the edge of the dough. Gently press down with your left finger in between the two fingers. Move two fingers’ width to the right and repeat — your left-most finger on your right hand will reinforce the impression made by the right-most finger from the first crimp. Or just crimp the edges together however you wish. It all tastes the same in the end. Brush the entire surface of the dough with the egg wash. Make slits using a sharp paring knife all over the surface. Bake for 20 minutes at 425ºF. (If using a stone or Steel, you might consider lining it with parchment paper). 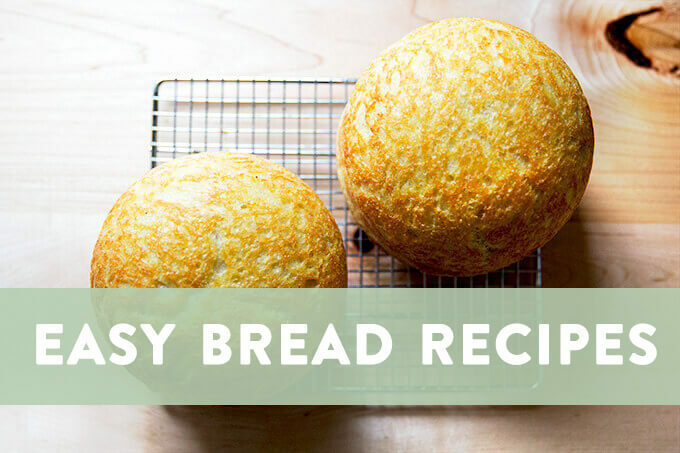 Reduce the temperature to 350ºF and continue baking until golden all over, anywhere from 30 minutes to an hour longer depending on your oven. I have been baking them closer to 30 minutes at 350ºF, but aunt Marcy, the expert, bakes them longer, so use your judgement. You must have read my mind! 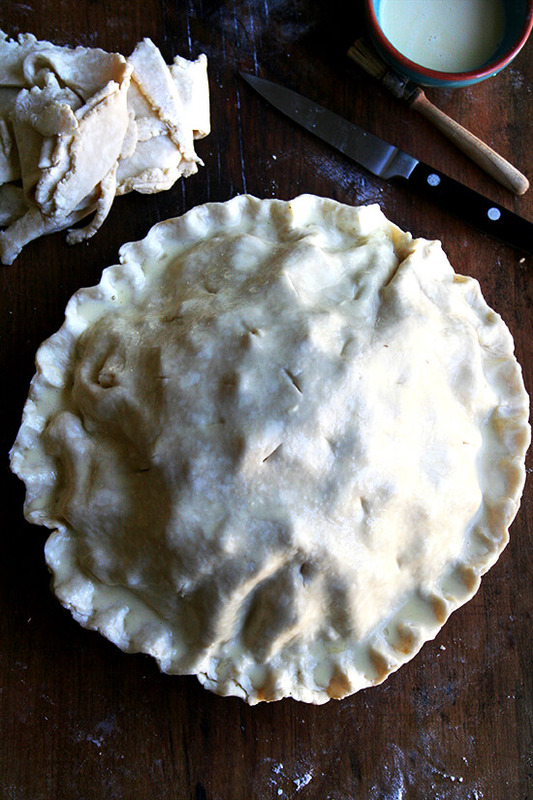 I am planning to make an apple pie this weekend – very excited to try your recipe! Also, I LOVE when I have pie dough in the freezer. It makes it so easy to throw dessert together anytime. I need to get on making a few batches! 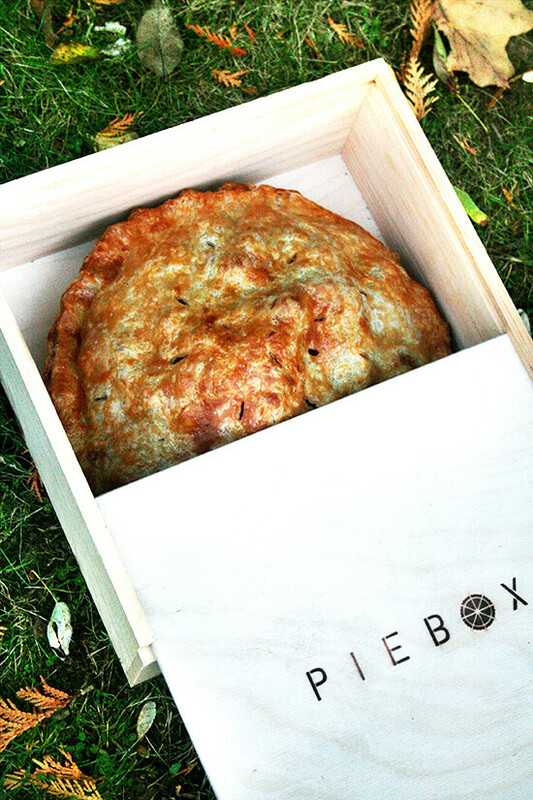 Also, that piebox is AMAZING. Alexandra – First off, you’re awesome. 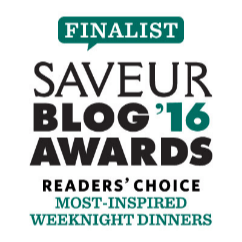 Thank you thank you thank you for this wonderful blog. The pie looks delish and I will most definitely be making it. 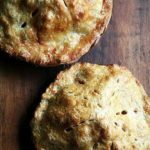 I love apple pie and trying new pie recipes. Secondly, can you really freeze pie dough like that? 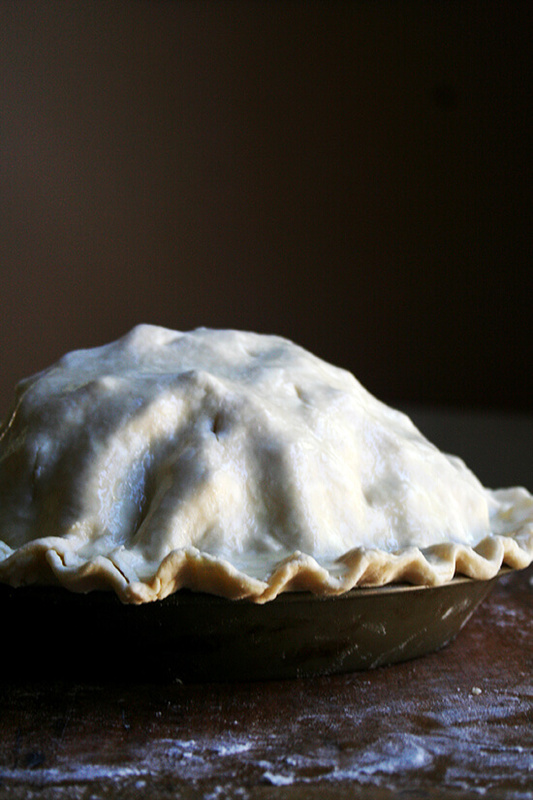 I would love to premake my Thanksgiving pie dough. It’s probably the most labor intensive part of my Thanksgiving. (We eat a lot of pie.) I love the holiday season! Thanks a bunch! Oh, Dana, thank you. You are too kind! And yes, absolutely in regard to freezing pie dough. 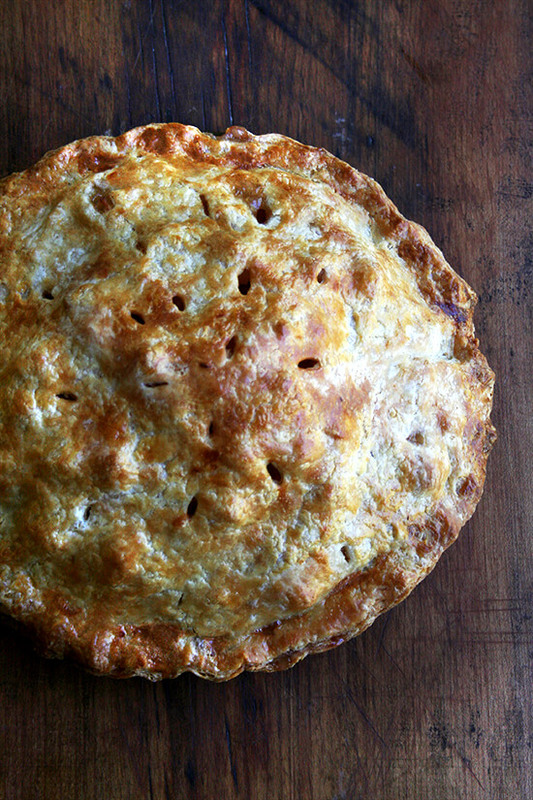 I would just thaw it in the fridge the day before you plan on baking the pie — overnight would be plenty of time. We LOVE pie in my family too. I’m enlisted to make apple pie for Thanksgiving. I can’t wait. Let me know if there is anything else! LOVED your tutorial and of course your pie looks A m a z I n g. Your aunt sure knows her stuff. Am anxious to try all your suggestions. 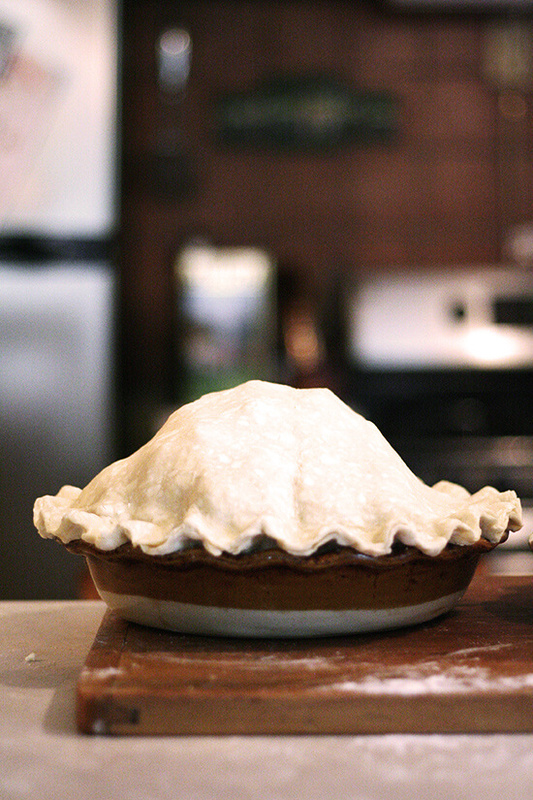 Pie crust can be daunting. Thanks for doing it. 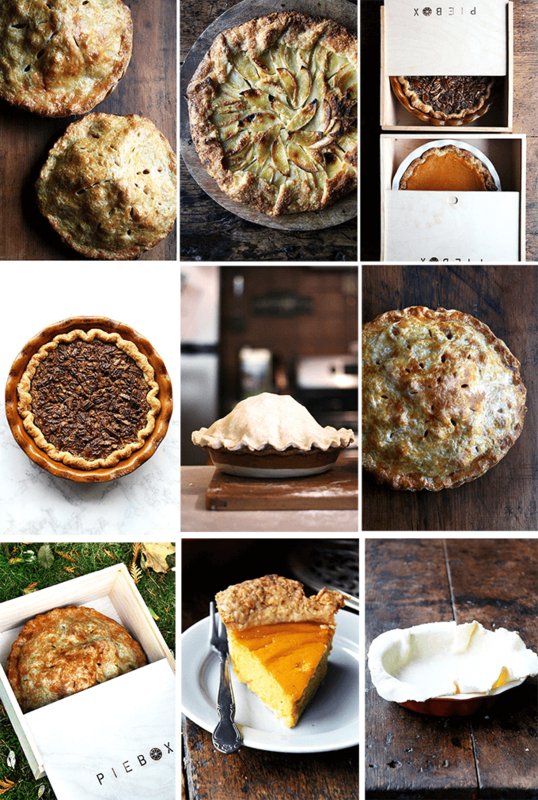 Soooo beautiful….sigh….and what a nice surprise to see a new post this soon….That is the prettiest pie I’ve ever seen and as always, the photos make me want to rush to the store for apples! Don’t you just love, love, love Fall?! OK, seriously, I have never seen a pie so tall! Impressive! Alexandra – more stunning beauties. And perfect timing for the fall, have to go grab some apples and get to work this weekend! And i love all these pie techniques. That looks like a beautiful pie! I am delighted to accept Aunt Marcy’s guidance because she obviously knows what she is doing! This pie is epic!! I have always said that I want a mess of pies at my wedding, instead of cake. So I love this! I couldn’t agree more. As soon as Anne asked me, I wished I had thought of the same thing. Alas. Wow, what a generous and beautiful gift! I don’t know what I would do if someone gave me 12 rounds of pie dough?! Amazing. Hope your shoulder feels better soon. So happy to hear about the millet muffins. Looks awesome! 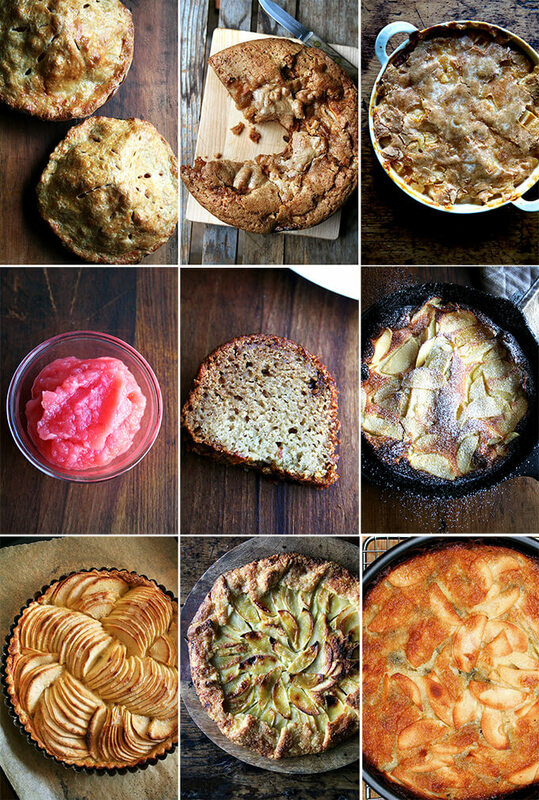 I so have to make this, it will be a great “answer” to my husband’s French apple tart! Thumbs up on cloth diapers, I do the same and could not agree with you more, particularly on the “wash at night, dry the next morning” thing! Let me know how your mom liked the cheese! Mama Poule, I think we need to hang out 🙂 So glad you approve of the cloth diapers. I cannot wait for my mom to try the cheese…wish I had some right now to give her. I sent one to my aunt Marcy (also here for the weekend to watch the kids), too. They are going to be in heaven. You know, I thought the same thing! Hope the weekend was fun–both for you and your husband at the wedding and for the kids with those fun babysitters! 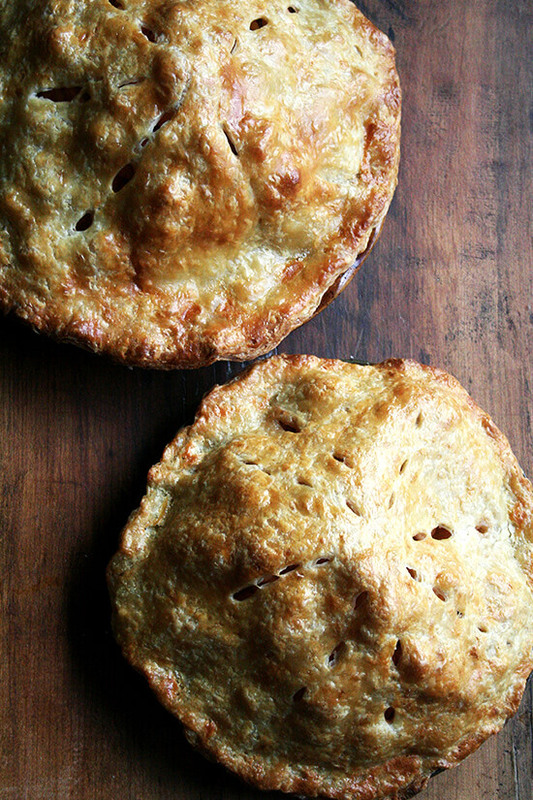 I love apple pies in the fall. What does Marcy think about apple slices versus apple chunks? You are right. I should have pie crust in the freezer! So, Marcy happens to be visiting right now, and she is partical to chunks vs. slices. She finds that slices tend to get to mushy. That said, she understands using those turning slicers especially if you need to peel and cut a lot of apples. Hope that helps! G’day! Loved your step by step photos, very inspiring, true! you didn’t want to put Ella and Graham to work on a pie assembly line? I can imagine with their help you’d have some *lovely* and quite *creative* pies. 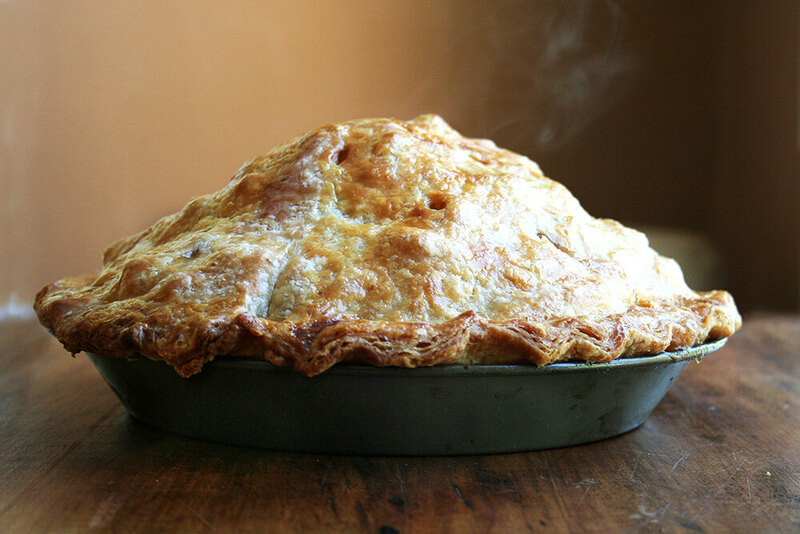 This pie of yours is absolutely stunning. So gorgeous in fact that I worry it might upstage the bride and groom. That rippling ridge! the golden crust! those darling slits! Sigh, heaven. I think every family needs an aunt Marcy, perhaps you can lend her out? Or better yet, keep posting her tips here on your blog, especially as the holidays approach. Oh, Talley, it’s always so nice to hear from you. Aunt Marcy would jump at the chance to come lend a hand, especially with Alice around. Seriously. You would have so much fun together. PS: Please post more pics of Alice immediately! You’re so lucky to have so many pie-makers in your family! Great resources! This pie is gorgeous! I’m saving the tips for later. Hi Ali. That is one good looking pie! I have made a lot of pies, but pie dough has always given me trouble. I admire your aunt for being a pie genius. Few are. I have turned to pat-in-the-pan crusts. I like the shortbread-ness of them and you don’t have to roll them out and they don’t tear and they don’t give you any trouble. They are not flaky, true, but they are tasty. A freezer full of pie dough? That could be really fun. I made this last night and it was delicious and a hit – our guests were impressed by how tall it was. Mine took about 45 minutes to bake at the lower temperature, FYI. 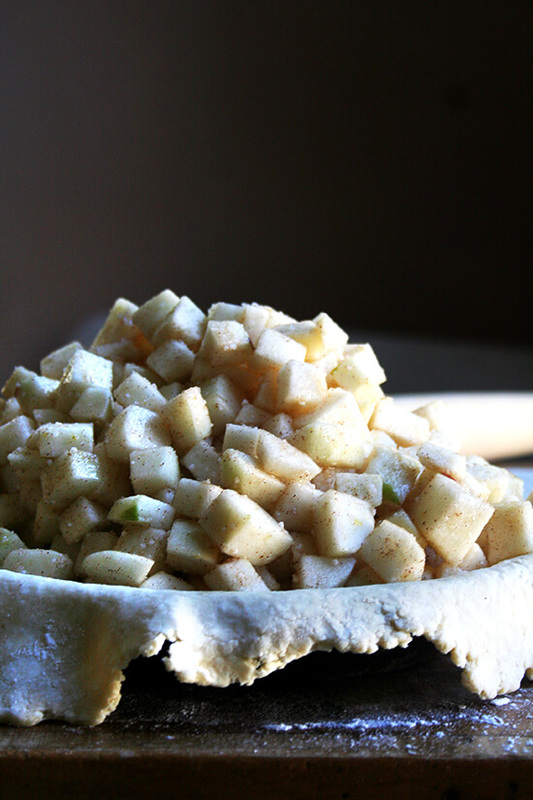 I love the dicing of the apples rather than leaving them in slices – it makes the pie easier to eat! Thanks for another great recipe. On your recommendation I bought a PieBox. There was an issue and their customer service is top-notch! Did you know they make a CakeBox too? It can hold 18 cupcakes or a 9 inch cake. Love it! I’m gonna make pie dough tomorrow….have you ever heard of butternut squash pie? 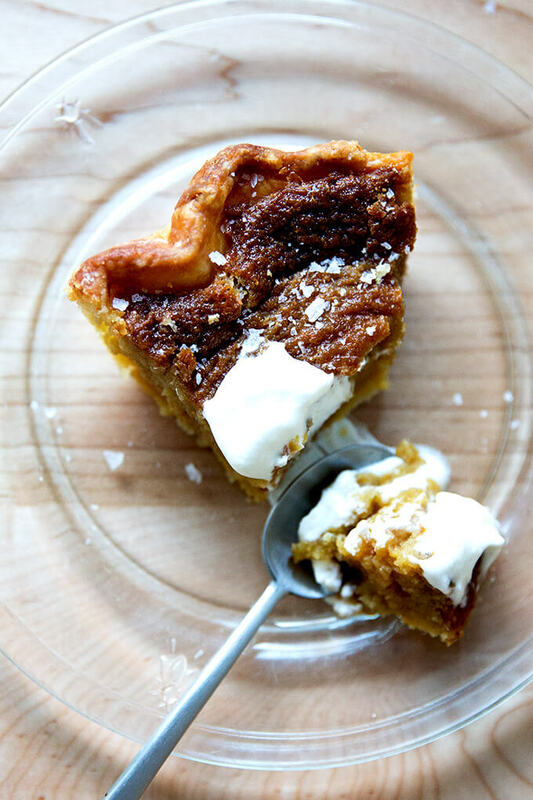 It’s my fav this time of year….I got the recipe out of one of my favorite books, The Dirty Life by Kristin Kimball….the pie is called “Ronnie Hollingsworth’s Most Excellent Squash Pie” and it is AWESOME! 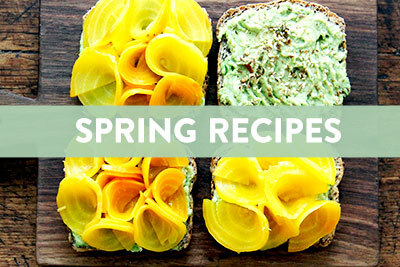 OMG, totally looking up the recipe. That sounds amazing right now! Might have to bring that to Thanksgiving at my sister’s! 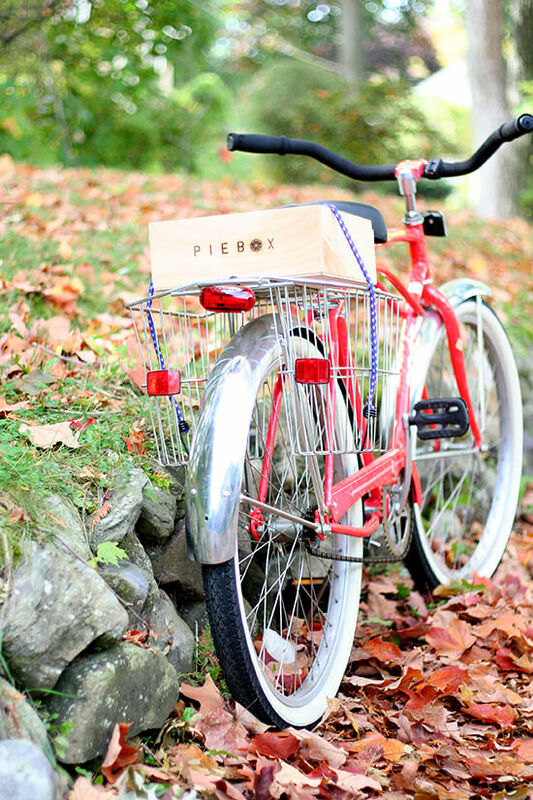 That pie box is amazing! Makes me want to make a bunch of pies and leave them on unsuspecting people’s doorsteps. Though I probably wouldn’t eat a surprise pie I found on my porch…. Haha, I love it. I suppose I wouldn’t either. At least not the whole thing 🙂 I am dying to buy the cake box now. I so don’t need it, but I have to have it. Ali, do you have any suggestions for a way/s to keep pie dough from shrinking when you blind bake the crust? I’ve always had that problem and as of yesterday I still do! lol! First I “dock” the bottom of the crust with a fork; then I line it with parchment and fill it with dried beans. You can see that the crust shrinks a little bit, but the technique works pretty well. Hope that helps! xo! Hi Alexandra!! This looks absolutely DELISH!!! I have a VERY dumb question but is the sugar normal or confectioners sugar? Because the pies I’ve previously made all had normal. Fun! I hope it turns out well. Let me know if you have any other questions along the way — I’ll try to check my email during the day. It is normal sugar, not confectioners. Good luck! Your wedding pie looks delicious and I want your Aunt Marcy to be my aunt too!! She would love to be your auntie! What a gorgeous Apple Pie! I love having pie dough in the freezer. The only thing better is having it already rolled out, set into a pie pan, all ready to go in the freezer! That makes pie making a snap. This is an inspiring and beautiful post. Okay so first off, you have an amazing blog and I’m so glad I found it!! Tried the pie today and it turned out deliciously tart with just the right amount of sweet, everyone loved it! ( I added the lemon zest and 3/4 cup sugar ) …I have a few questions… Even though the pie was incredible, I did have some oozyness issues, the apples ( I’m guessing ) let out a fair amount of water and the melting of the sugar definitely added to form a sort of ‘syrup’, I let the apple, sugar + spice mix sit for about 20mins while the dough chilled. I winged it and just added the ‘syrup’ to the pie along with the apples. Should i not have done that? But i did like the caramely taste of the baked syrup, I just drizzled it on top of a piece of pie just before serving it, was delicious and worked out for the best 🙂 as for the crust, i used your foolproof all butter pie dough since i did not have a processor. my crust didn’t really set well, was sort of crumbly and cracked a lot when I tried to roll it, but eventually came together a bit chunkier than yours and I managed to fold and place in the dish. Should I have added more water you think? But all said and done the texture was great! It did ‘shatter’ yumm!! When I get my processed back I’m going to try your lovely aunt’s version! Thanks to her and to you for all the insightful tips!! Your pie looks amazing, by the way!!! 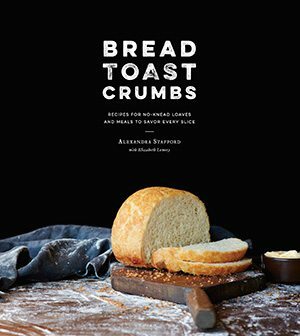 And also, I’m just going to jam this in here, I made your banana bread the other day, and when I added the milk, mixed with a spoon on yogurt (instead ofnthe buttermilk) the whole batter curdled! Do you know why this happened? 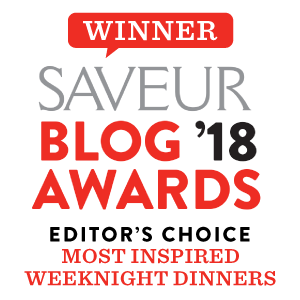 I baked it off anyway and it tasted good but maybe a little dense… Would love to hear your thoughts on this..
Keep up the great work on the blog! Will be checking in for more soon!